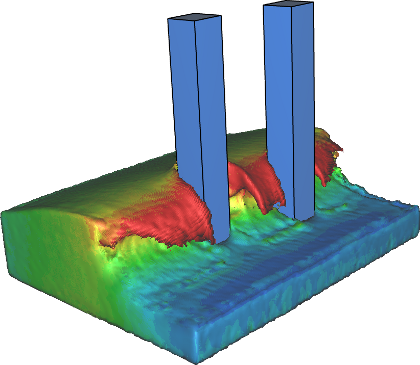 Do you have special challenges for welding simulations or fluid-structure interaction simulations? Then perhaps Impetus ADVANCED has something to offer you. "Do you have special challenges for welding simulations or fluid-structure interaction simulations?" Impetus ADVANCED currently offers the choice of two alternative computational modules. One module for welding simulations and one for fully coupled fluid-structure interaction simulations. Let us know more about your processes and needs to see if these software products can help you. WELDSIM is a finite element code specialized in simulations of welding processes. It consists of a thermal, a micro-structure and a mechanical sub-model, that are coupled sequentially. By coupling the thermal solver to a micromechanical model, several parameters, such as yield stress distribution in the HAZ, can be determined. 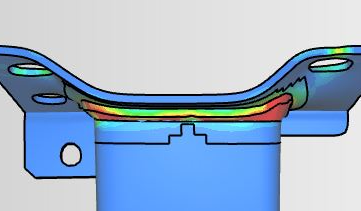 The FE module can directly utilize the results from WELDSIM, allowing large deformation analyses to be run with correct material properties in the HAZ. This module is used to describe fluids, such as water. The module adds to and communicates with the FE module in order to obtain fully coupled simulations through a fluid-structure interaction interface. The implementation enables a high scalability on GPU machines and allows 20,000,000 SPH element models on a standard desktop computer.